Effectively drill into concrete, stone and other strong masonry materials with an SDS drill available in our online store at SGS. Drilling with SDS drills is the simplest and most efficient way to bore into tough material, with different sized models to suit many varied purposes for all your home DIY projects. Browse our range of SDS drills and choose from well-known brands Ryobi and Milwaukee. Here at SGS, we’re delighted that the majority of our SDS drills for sale have been produced by Ryobi and are part of their ONE+ range. They feature long-lasting lithium-ion batteries and professional style factors, such as ergonomic GripZone handles for added comfort while you work and variable speed, for full control over your Ryobi SDS drill. Find the best Ryobi SDS drills for sale here at SGS Engineering. We are equally as excited with our Milwaukee range which have Redlink plus intelligence systems which deliver the most overload protection for tools and batteries. Superior power to weight ratio in its class with Milwaukee designed and built brushless POWERSTATE™ motor for up to 3x longer motor life and up to 2x more run time. Milwaukee have introduced an app called One Key which enables the user to customize, track and manage their tools. Non-hammer settings along with pneumatic ones mean you can easily drill through wood, metal and masonry. Cordless models are great for exterior application and when you need to drill in a tight area, while corded versions deliver more power. 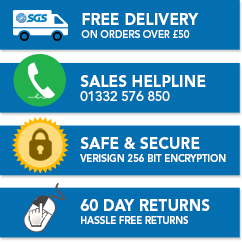 We have free next day delivery option available - check terms and conditions here. So whether you’re looking for a Ryobi SDS drill or a Milwaukee SDS drill, make sure that you contact a member of our team for further help when browsing the SDS drills for sale.